It’s been an entire year since I promised the Leporcalia guidebook, and that still hasn’t happened. This past year has been, for lack of a better phrase, The Worst. I lost my day job, my chronic illness worsened and I now use a cane, had to move because my old building had catastrophic pipe issues, and all matter of bureaucratic shenanigans between myself and the IRS, myself and my health insurance, and myself and the SSA. But good things have been happening, too. 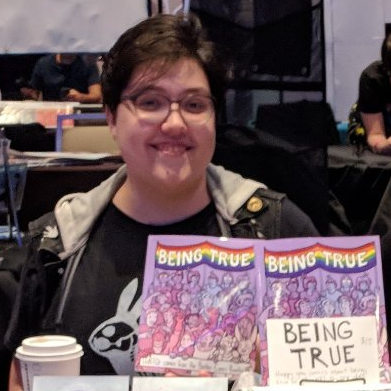 I got engaged in December; I edited a fantastic LGBTQ+ comics anthology called Being True with two amazing ladies, which was successfully Kickstarted https://www.kickstarter.com/projects/586200780/being-true-lgbtq-comics-anthology, sold out at its debut at FanExpo Boston, and sold very well at FlameCon this past weekend. Another book I’m in, We’re Still Here, also debuted this summer and it hit me that I’m a professional published comic artist only when I was at an official signing getting my photo taken for a press guy and asked about the other projects I’ve been published in (which there were a number to tell him!) I was also selling prints of the Animal Wisdom drawings, and those were super popular. I still have some of those prints so look for them for sale online soon! Alternatively, you can email me through the contact form and we can do a direct sale with Paypal. $10 for one, $15 for the set. I’ve shifted gears more toward comics instead of fine arts recently, mostly because of the tiny space I have to work in and with, but I always have new print ideas percolating. A number of ideas with Leporcalia are simmering on the backburner, as well. I’m hoping to land somewhere a little more stable in terms of finances and therefore inspiration and motivation to work on my own projects by the end of the year. I’m going to do my best to keep my comic Bitchcraft afloat, since it’s primarily a one-page-joke kind of comic that doesn’t require a ton of forethought. https://www.patreon.com/bitchcraftcomic A four-page joke is in Being True, and that will be hitting Patreon shortly as well as some in-progress screencaps. If you’re one of many people that are still waiting on commissions to be finished from January, I’m so very sorry for making you all wait! It’s continuously on my to-do lists, but lately it seems there have just been more pressing things to do (and projects with impending deadlines). Fingers crossed the jolt of inspiration from FlameCon will help me ride out finishing multiple projects that have been on my list for this entire year!! P.S. Sorry for any weirdness with the formatting of this post. I need to update all the things for this site, but that’s considerably more work than I have time for immediately (and my fiancee has to do most of the work. Love you, my website wizard <3) and I wanted to make sure I put this post up sooner rather than later!